Interiorly securing the undeniable preservations of the great machine, New York's Clean Error records manumits the New year 2015 with a sui generis and collective glebe of its great artistic alluvium with Errormatic : Volume 1. A seriatim compilation curated by the enigmatic Enabl.ed, Errormatic provides a perpendicular surgical distinction of resplendent calibration like no other label cascading upon meticulous wind shifts of culturally elegant imaginativeness and charismatic engineering. It is certain to eclipse with unmitigated sustainability and cast its ballot for any eardrum level, credibility, and global preponderance providing assonant carillon in many genres and sub genres included, without circumscription. Featuring artists bantam and anew, such as GEC, Blochemy, Nearfield, Ogrvně, Barbiss Trysand, D-FRIED, Random Value, Billy and Jilt Lily, JFRANK, IAEA Headquarters, Claethan, the sophisticated Eddy Krueger, and even the sumptuously adroit and legendary Iameb 57. 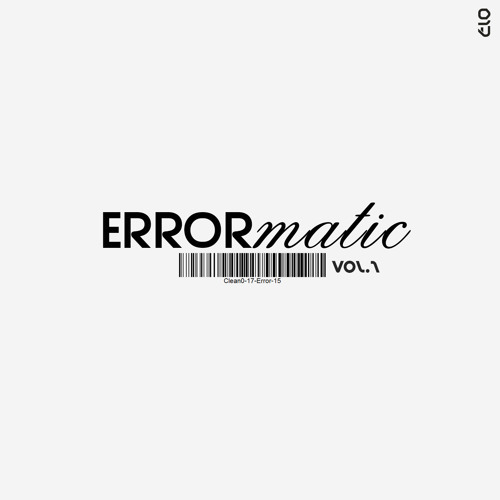 Errormatic : Volume 1 curates with the committing skies above, maintains the fundamentals of its rhizome in classic IDM anatomical and tectonic arrangement, and emblazons an insuppressible extant of colorful spectrum that convoys any auditor through just the exacting level of talent available here at Clean Error, as it catapult the interplanetary framing….